The largest ever Australian naval fleet arrived in India this week to conduct the biennial AUSINDEX naval exercises with the Indian Navy. The size and shape of this year’s exercise is a major step forward in defence cooperation between the two countries, even if significant political caution remains about the relationship in New Delhi. This year’s version of the AUSINDEX naval exercises, which is focusing on anti-submarine warfare (ASW), is by any measure the largest and most substantive yet. The sheer size of the Canberra has created considerable attention. But in substantive terms the big story is the participation of submarines and submarine hunters from both countries. This represents just about the top shelf in naval cooperation. Submarines are among the most sensitive assets of any navy, and countries are usually very cautious about revealing anything to anyone but the closest of friends. This is a good indication of the high degree of trust that exists between the two navies. 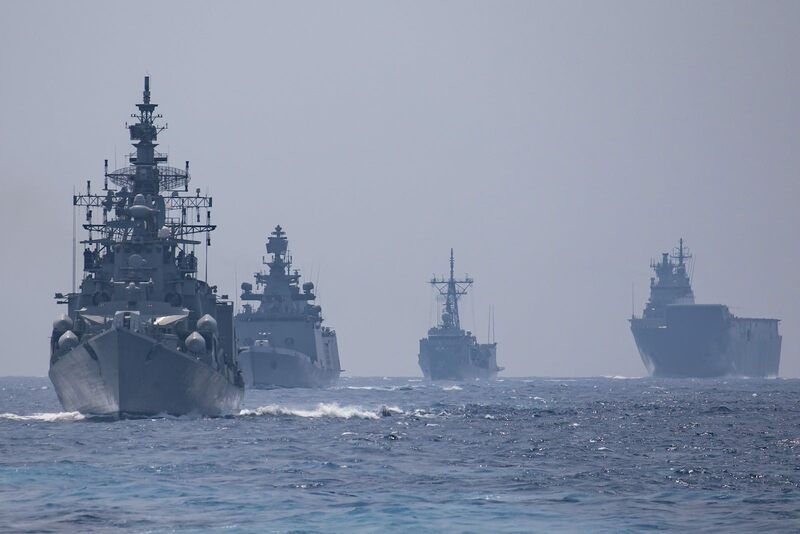 Yet the value of these exercises in developing interoperability between the two navies is currently severely constrained by the lack of networked communications. A US-India agreement signed last year has not yet been implemented, meaning that the Indian Navy is not yet using US-sourced CENTRIX communications systems on their ships. Until this networking hurdle is overcome, meaningful interoperability between the navies will be difficult to achieve. Hurdles to further security cooperation also continue at a policy level. Some Indian decision-makers continue to oppose Australia’s participation in the annual Malabar naval exercises, which began as US-Indian bilateral exercises and were extended to include Japan in 2015. New Delhi’s rather timid position on Malabar and the Quad may stem from concerns about offending Beijing. The reason for this position is unclear to anyone outside the Indian Foreign Ministry. In some respects it is consistent with India’s historical non-aligned baggage to oppose multilateral security cooperation, although the Modi government has for several years been steadily discarding those old taboos. But the addition of Australia to what is already trilateral exercises between larger powers would seem to make little practical difference. The theology of “three is good, four is bad” remains somewhat of a mystery. Similarly, New Delhi has gone out of its way to publicly characterise the Quadrilateral dialogue talks among India, the United States, Japan and Australia as principally about economic cooperation – for example, to provide regional alternatives to China’s Belt and Road Initiative. It’s not about regional security at all. To what extent Beijing would believe this line is an interesting question. New Delhi’s rather timid position on Malabar and the Quad may stem from concerns about offending Beijing. Since the Wuhan Summit between Prime Minister Narendra Modi and President Xi Jinping in April 2018, the Indian government has noticeably toned down its public rhetoric about China’s moves in the region, apparently in an effort to mitigate strategic competition between the two countries which has been ramping up in recent years. Whether the so-called “Spirit of Wuhan” lasts much past India’s general elections next month remains to be seen, but few would see the Wuhan understandings as any sort of long-term truce between the two countries. Granted, the Himalayan border between the two has been relatively quiet since a major confrontation at Doklam in June 2017. However, there are few signs that China is slowing the expansion of its influence across India’s South Asian neighbours and elsewhere in the Indian Ocean region. However, India’s position towards Malabar and its public down-playing of the Quad do point to real reticence on India’s willingness (or perhaps systemic constraints on India’s ability) to form meaningful balancing relationships against China’s assertive behaviour across the region. But it might well be that after next month’s election the new Indian government has greater freedom to move Indian security policy beyond the highly restrictive boxes that Indian policy-makers sometimes impose upon themselves. Macron's future will be determined not only by his win, but by his margin of victory.